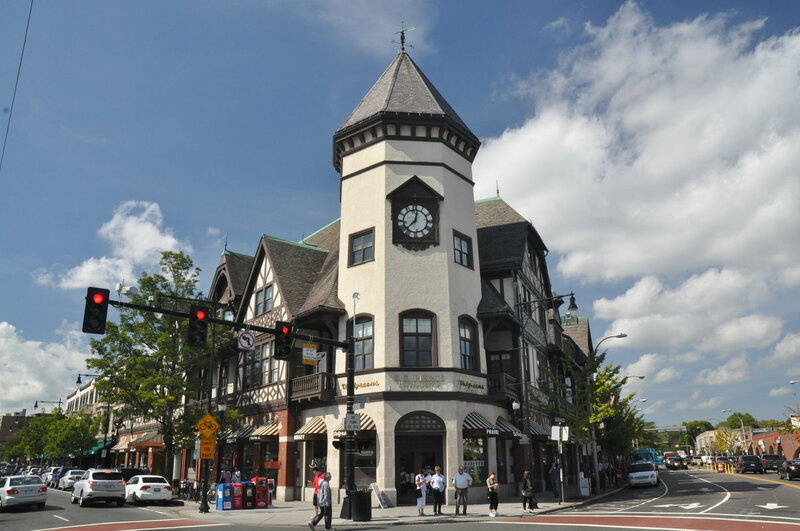 Centered at the intersection of Harvard and Beacon Streets in North Brookline, the Coolidge Corner neighborhood takes its name from a family that operated a general store in the mid-1800s serving the country estates of wealthy Bostonians. The area developed rapidly as a residential and commercial hub following the extension of trolley service from Boston in the late 19th century. Today, the first thing riders on the C-Line notice is the Tudor-style S. S. Pierce Building with its pitched roofs and octagonal clock tower. Built in 1898 as an outpost of the S. S. Pierce grocery business, the building currently houses a Walgreens Pharmacy and a Radio Shack below several stories of offices. A second building boom between 1920 and 1930 resulted in most of the other area landmarks. Standouts include the Art Deco bank (now a Bank of America branch) diagonally across from the S.S. Pierce Building and the Arcade Building two blocks north on Harvard Street. The Arcade Building features a two-story atrium with a variety of small shops including a comic book store, a salon, several tailors and a take-out restaurant. Coolidge Corner is the center for shopping in Brookline and has a store for almost everything. While several national retailers have staked out prominent positions in Coolidge Corner, there is still a strong independent spirit, especially shown with the non-profit Coolidge Corner Theatre’s art-house films. The stores range from small boutiques and shops, including Brookline Booksmith, to multiple retail chains, such as Walgreens, Game Stop, Staples, Gap, Radio Shack, Paper Source, and much more. Trader Joes is also available in Coolidge Corner to fulfill any grocery shopping needs. Getting to Coolidge Corner from Boston is easy: By subway, take the green line, C “Cleveland Circle” train to the Coolidge Corner stop. The #66 bus, from Dudley Station to Harvard Square, runs along Harvard Street, and stops at the Harvard and Beacon Streets intersection. Street parking can be difficult, but there is a metered parking lot directly behind the Arcade Building on Center Street.